Want to go abseiling? Here's what you need to know! What is Abseiling or Rappelling? The dictionary defines abseiling – or rappelling as it is it is more commonly known in the U.S. – as the act of sliding down a rope under controlled conditions in order to make a safe descent off a cliff face or other sheer surface. The term traces its origins to the German word "abseilen," which translates as "top rope down." Abseiling can be a very dangerous activity, and should not be attempted by inexperienced individuals without proper gear, guidance, and training from skilled climbers or climbing instructors. It is a technique used by people who are rock climbing, ice climbing, kloofing, canyoneering, and mountaineering to get down steep cliffs or even man-made objects, such as buildings or bridges in a safe, efficient manner. It is a very common practice amongst alpinists and adventure athletes across the globe, providing a quick and safe way to descend sheer structures. Still, there are definite dangers involved that all climbers should be aware before proceeding. This now-common method of descending from a mountain can trace its origins back to an alpine guide by the name of Jean Charlet-Straton who led expeditions into the Alps from Chamonix, France back in the late 1800s. As legend has it, Charlet-Straton failed in an attempt to summit Petite Aiguille du Dru on the Mont Blanc Massif back in 1876. After finding himself stuck on the mountain, he had to improvise a method of getting safely back down. The technique that he came up with involved using the abseil approach, which meant fixing a rope to the rock face, then attaching it to himself. From there, the Frenchman would slowly lower himself down the mountain, releasing the rope a bit at a time in order to control the descent. Three years later Charlet-Straton would complete the successful summit of Petite Aiguille du Dru, and would use this newly-perfected method extensively throughout the climb. He had two other Chamonix-based guides with him on that expedition, who also used the same technique. It wasn't long before others picked up on the practice as well, with the Alps climbing community turning it into a standard practice amongst mountaineers. Today, abseiling is considered an important basic skill that every climber should have in their skillset. It is not only useful in emergency situations, but is a common way of getting down a mountain. That said, it is estimated that about 25% of all climbing deaths occur while rappelling, which is why proper gear and training are recommended before attempting. Abseiling requires a set of specialized equipment to be done safely and securely. That gear includes ropes of course, with most climbers employing the same ropes that they use to go up the mountain to assist in their descent too. Other climbing gear used for rappelling down a face include anchors for supporting the rope, descenders that allow alpinists to feed out rope in a controlled manner, and a harness that fits around the climber and works conjunction with the descender to slowly lower the person back down the cliff. Helmets and gloves are also recommended to help keep climbers safe as well. Most of this gear is not specific to abseiling and is already part of the basic climbing kit. It may be used a bit differently on the descent, but its purpose is much the same while going up or down. In other words, the technique was originally created using the gear that was already on hand, which continues to be the case today. 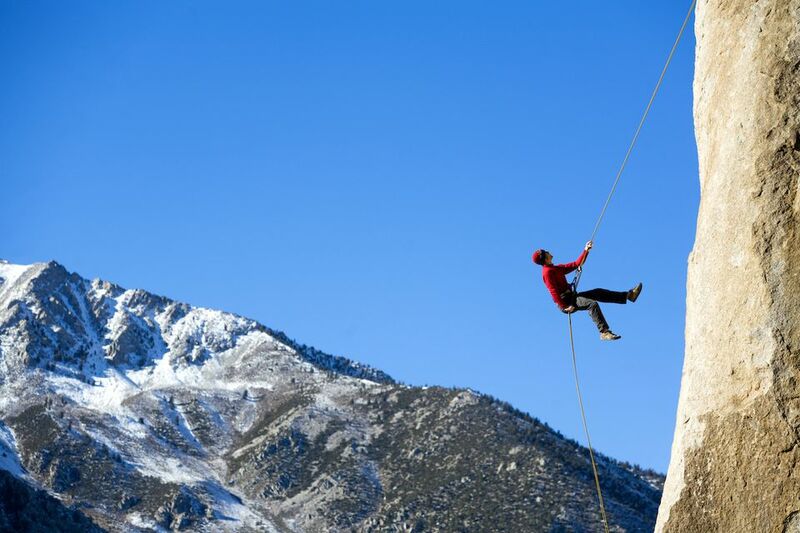 Although the origin of abseiling revolved around climbers lowering themselves down a mountain for safety purposes, over the years it has evolved into a skill that is used in a number of other activities as well. For instance, canyoneers will rappel down into narrow slot canyons safely, while spelunkers will do the same when entering vertical cave systems. It has even grown into its own sport with adventure seekers abseiling for the thrill of it alone. Additionally, military units have adapted the skill for quick insertion into challenging locations that might otherwise be difficult to reach. There are a number of different techniques that can be used for rappelling, although the traditional method involves lowering oneself down a rock face feet first, while facing the wall. While descending, the rope is let out slowly and gradually, allowing the climber to safely work his or her way down the wall. Occasionally a climber may use their feet to push off from the wall, allowing them to drop at an accelerated, but still controlled, rate. This is also useful for hopping over open chasms in a rock face where keeping your feet on the wall may not be practical or even possible. Other repelling techniques include going face-first down the rope or even facing away from the wall altogether. These methods are meant for experienced abseilers who have plenty of training and experience under their belt however, and are definitely not for beginners. It takes months –– or even years –– of practice to get to that level, with strict supervision from an instructor who knows what they are doing. While abseiling is an efficient and useful method for descending a sheer surface, it can also be dangerous when done incorrectly. Generally speaking, abseiling is not an activity that most people set out to do independently of other adventurous outdoor activities. Instead, it is part of rock climbing, mountaineering, canyoneering, or similar sports. Still, there are some amazing places where repelling remains an active draw. Here are a few of them. Cape Town's iconic Table Mountain is a popular place for repellers thanks to its stunning views and easy access from the city center. Visitors can take part in one of the longest commercial abseil adventures in the world, dropping some 365 feet from top to bottom. Along the way, they'll get all of the training, equipment, and support they need to safely touch down, while getting a bit of an adrenaline fix along the way too. New Zealand's impressive Waitomo cave system has been called a "Lost World" and for good reason. These massive caverns can only be accessed by repelling into its depths, where visitors will find an underground ecosystem that is largely untouched by man. A company called Waitomo Adventures can lead you through this amazing place, giving beginner and expert abseilers all the advice they need along the way. The hundreds of miles of canyons found near Moab, Utah are just begging to be explored and the best way to do that is to drop into that twisty maze of tunnels and gorges by abseiling. Wind Gate Adventures offers visitors a chance to go canyoneering in those slot canyons or choose to just go on a rappelling excursion instead. Either way, you'll get an entirely different perspective on the desert and the secrets it holds simply by learning to safely descend a rope into its hidden passages. Experienced climbers looking for a new challenge may want to head to Khao Yai National Park in Thailand. Once there, they can join Sarika Adventure Point on a tour that takes climbers down five different waterfalls, putting their rappelling skills to the test along the way. The 230-foot drop off Song Pee Nong falls is especially exhilarating and beautiful. Bring a waterproof camera to get some truly exceptional photos along the way. El Capitan is quite possibly the most iconic rock climbing destination in the entire world, but it is also a mecca for abseilers too. El Cap's massive 3000-foot rock race is not for the faint of heart and this descent should only be made by the most experienced of climbers. Still, it is a thrilling, wild ride from top to bottom, in truly one of the most spectacular outdoor playgrounds on the planet – Yosemite National Park. And if you're not up for the El Cap itself, there are plenty of other places to climb and rappel inside Yosemite too. Costa Rica is a mecca for adventure travelers, providing plenty of places to climb and rappel in a tropical paradise setting. Two of our favorites are the Arenal Volcano and the town of Jaco, both of which provide opportunities to descend beautiful waterfalls using the abseil method. There are numerous operators that can take visitors climbing and rappelling in a variety of spots across Costa Rica, but Pure Trek has some of the best itineraries around and at reasonable prices. The Austrian state of Tyrol is another destination that offers plenty of opportunities to climb and rappel. In fact, it is a hot spot for European climbers looking to escape some of the more crowded peaks in the Alps. Visitors to Kronburg will find some amazing places to rappel, including some drops that are more than 130 feet in length. These descents can be difficult however, so only experienced alpinists and abseilers should apply. As we've mentioned on several occasions, rappelling is a dangerous activity, and it is estimated that about 25% of all climbing deaths occur while the person is descending using the abseil method. Because of this, anyone attempting the activity for the first time should do so with a trained and experienced guide who can show them the proper technique and ensure that all of the equipment is being used in a safe and secure fashion. If you are learning to rock climb or abseil taking a proper course that teaches the skill is highly encouraged. When done properly, it can be safe and efficient, but without first acquiring the necessary skills, the danger level goes up significantly. Rappelling is a common activity in adventure sports and adventure travel. It can be incredibly thrilling to do and it is a good skill to have in your quiver. It is also something that you can learn fairly quickly under the proper training and guidance, which makes it all the more important that you pick up the skills before embarking on an ambitious climbing excursion.